Works with: Verizon, AT&T, T-Mobile, H20, RedPocket, SimpleMobile etc. Two cameras, one amazing photo. 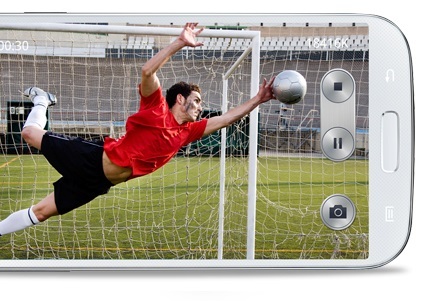 With this Samsung dual camera phone, you can capture special moments of your life and also be in the picture. Dual Shot will simultaneously shoot with the 13MP front facing camera and the rear camera, and then automatically merge photos from each. You can also choose from a wide variety of styles to choose from. Samsung Story Album lets you organise your photos and create albums based on specific events or customise them the way you want. This easy-to-use photo album software even lets you apply themes and choose various layouts, and then print the photos and hold the memories in your hand. Say or type what you need translated into your new Samsung Galaxy S4 and it’ll read or show you the translation. This multilingual app is a handy companion while travelling abroad, allowing you to easily communicate with locals, discover exotic foreign dishes, and explore hidden hangouts around the world. Support: English, German, French, Chinese, Spanish, Italian, Japanese and Korean. * S Translator relies on a data connection and available languages are limited. Additional terms and/or charges may apply. Results will vary by circumstance. Now you can control your phone by just passing your hand over the screen and not actually touching it. Just wave your hand across the screen to move quickly through content and photos. Respond to your calls quicker by answering with Samsung Air Gesture. Supported features include Quick Glance, Air Jump, Air Browse, Air Move and Air Call Accept. Connect your Samsung Galaxy S4 with your home entertainment system and let it be your TV expert. It suggests different programs based on your preferences, provides program schedules, and does the channel surfing for you. It even allows you to remotely control the TV or set top boxes. So sit back, relax and let the Galaxy S4 take the work and hassle out of TV for you. Stay active and fit thanks to S Health. It will track your workouts, daily intake, and weight levels. Meanwhile, Comfort Level helps you exercise in comfort by reporting temperature and humidity. Monitor your progress with both Health Board and various charts. 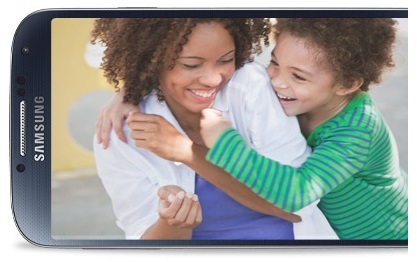 With the Galaxy S4, staying on track for better health has never been so easy. Give your eyes a rest and let the Samsung Galaxy S4 adjust your view. With 7 automatic modes and 4 manual modes, it provides the optimal viewing experience. See your favourite videos, games, books and emails displayed with amazing colour quality. Now you can get the perfect view. Hear everything with the right balance and perfect volume customised for you. Samsung Adapt Sound dials music up and down and balances left and right audio based on your hearing, the sound source and your preferences. It’s an optimal sound experience tailored to you. The Galaxy S4 does what you want and what you didn't know was even possible. Erase a photo's background distractions with just a touch, catch every part of your child's somersault, or capture your view of the city skyline. Preview photos and files or read a news article without ever touching the screen. Use one screen to check Facebook as you catch up on email. Offering a highly crafted design with a larger screen and improved battery life, the sleek and innovative Galaxy S4 is slimmer yet stronger, with less to hold yet more to see. Experience a whole new way to interact with your smartphone. Wave your hand at the screen to accept calls with Air Gesture™, read content by tilting your head or phone with Smart Scroll™ and preview content by barely touching the screen with Air View™. Enhance videos with Smart Pause™, which pauses any video that's playing when you look away from your phone. When you look back at the screen, the video resumes playing right where you left off. 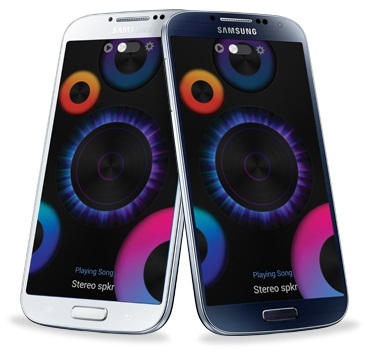 It's easy to connect, work or play with the Galaxy S 4. With Group Play, you can connect up to 8 phones wirelessly to play games and share your favorite tunes, photos, and documents - no Wi-Fi necessary. View all your content on a stunning 5-inch Full HD Super AMOLED™ display that's powered by a robust 1.9GHz quad-core processor - all in a light 0.29LB smartphone. The Galaxy S4 features a 5-inch Full HD 1080p Super AMOLED touch-enabled display, a 1.9 GHz quad-core processor, a 13-megapixel rear camera with Full HD 1080p video recording capabilities, 2-megapixel front camera, 16 GB of storage plus microSD memory expansion up to 64 GB (via optional card), 2 GB of RAM for excellent multitasking, a full complement of wireless connectivity (including Wi-Fi, Bluetooth, and NFC), and enterprise-ready security features. Equipped with a 13-megapixel rear camera and a 2-megapixel front-facing camera, the Galaxy S4 also boasts a Dual Camera function that allows simultaneous use of both front and rear cameras. When capturing moments, you can choose from a variety of frame effects that blend the two pictures naturally and also adjust the size of the small picture inside the big one. You can also select from eight different ways to combine the two photos taken by the front camera and the rear camera. The camera includes 12 shooting modes, including the Drama shot mode that enables you to see all the action in one continuous time-lapse and Sound & Shot for storing sound and voice together as the picture is taken. 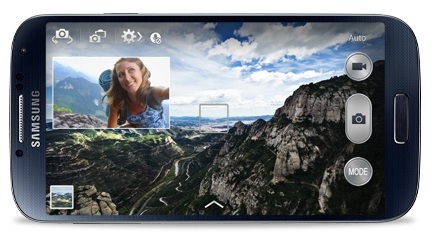 Additionally, the Dual Video Call function enables you to make and receive a video call with friends and family while showing what you are looking at during the call. Your special moments can be automatically stored in a photo album with the Story Album function. Photos are automatically gathered and sorted out according to your timeline, geo-tagging information, or a specific event to create a photo album. And your photos and videos are showcased on the world's first Full HD Super AMOLED display. Its 5-inch screen has a 441 ppi (pixels per inch) pixel density for stunning viewing quality and Corning's Gorilla Glass 3, making it stronger and more resistant to scratches and cracks than ever before. More than just a personal device, the Galaxy S4 makes the most of your relationships and enables you to easily share and experience many of life's pleasures together with family and friends, wherever you are. With the Group Play function, you can enjoy music, photos, documents, and games with those around you without even requiring a Wi-Fi or cellular signal. You'll be able to connect directly to other Galaxy S4 users instantly. For example, the Share Music option enables you to have the same song playing on multiple phones in sync to create the best party atmosphere. The GALAXY S4 ensures that tasks are effortless with innovative features that detect your face, voice, and motions to enable screen control with no need for finger touch activation. Samsung Smart Pause enables you to control the screen by where you look. When you are watching a video, the video pauses when you look away and then it starts right up again when you are back. Samsung Smart Scroll allows you to scroll the browser or emails up and down without touching the screen. It recognizes your face looking at the screen and movement of your wrist, and then it scrolls the pages up or down accordingly. Air View enables you to hover with your fingers to preview the content of an email, image gallery, or video without having to open it. You can even see a magnified view on the internet browser, or a phone number saved in the speed dial on the keypad. Air Gesture allows you to change the music track, scroll up and down a Web page, or accept a call with a wave of your hand. With S Voice Drive, you can activate commands via voice control for optimization when driving. Once connected with a car's Bluetooth connection, the phone automatically turns into driving mode to convert text to speech so you can easily and safely check messages with no need to look at the screen. Samsung Optical Reader automatically recognizes text, a business card, or QR code information, providing useful functions such as translation, call, text message, and search. 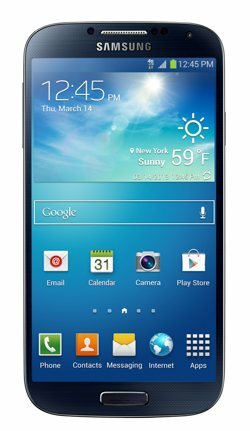 Offering a number of features for first-time smartphone owners as well as those switching from another operating system, the Galaxy S4 has a streamlined start-up wizard so you can begin using the device faster and learn about its unique features from the start. Originally introduced with the Galaxy S3, Easy Mode has been enhanced by simplifying the home screen layout, camera, calendar, messaging and the internet browser to make the settings menu easy to navigate. Once you're more comfortable with the Galaxy S4, you can switch back to the standard home screen interface. The Smart Switch PC application enables you to transfer contacts, messages, photos, music, calendar notifications and more from another phone to the Galaxy S 4. Smart Switch can identify favorite applications and recommend the same or similar applications within Google Play. With its infrared sensor (the same technology as your remote control), the Galaxy S4's WatchON feature can change the TV channel from your phone. And you get a custom TV guide that shows you what you like to watch. With Samsung Hub, you can watch more music, movies, and games with one app and one sign-in. Not only ideal for personal use, the Galaxy S4 is also a SAFE-designated device, which means it has additional security features to safe-guard sensitive data and communications. The Galaxy S4 is the first Samsung device to include Samsung's KNOX solution, which provides comprehensive mobile security at the hardware level and enhanced personal privacy for individuals at the software level. It delivers industry-leading mobile security for companies with stringent security requirements, and allows IT managers to access and manage the passcode-protected work information without disturbing the content within an individual's personal space (including photos, emails, music files and social network data). 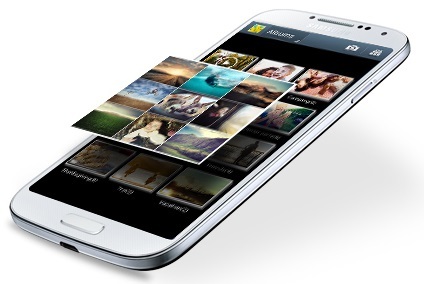 The Samsung Galaxy S4 delivers an effortless user experience. The Galaxy S4 does what you want and what you didn't know was even possible. Erase a photo's background distractions with just a touch, catch every part of your child's somersault, or capture your view of the city skyline. Preview photos and files or read a news article without ever touching the screen. Use one screen to check Facebook as you catch up on email. The Verizon Wireless 4G LTE network allows you to download photos, apps, and games in seconds and entire movies in minutes. LTE (or Long Term Evolution provides significantly increased upload and download speeds over 3G networks, as well as significantly reduced latency (or lag time). Verizon Wireless expects 4G LTE average data rates to be 5-12 megabits per second (Mbps) on the downlink and 2-5 Mbps on the uplink in real-world, loaded network environments. With these blazing fast speeds, you'll be able to stream HD movies without the annoyance of constant pauses to buffer the video stream--as well as quickly download HD-quality movies right to your phone in minutes. Additionally, you'll be able to download a new song file in about 4 seconds or upload a photo to your favorite social networking site in about 6 seconds. The Verizon Wireless 4G LTE mobile broadband network will also redefine the mobile office for business users. Business applications that used to require wired networks will be untethered forever, allowing you maximized productivity and efficiency while you're out of the confines of your office. Enhanced security lets you tap into most VPN networks with less waiting, and faster responsiveness enables you to upload 10 MB presentations back to your team in less than 25 seconds.